Quickly and easily get a customized, full-featured website for your Club or District. Empower any authorized member to update your website or manage your club. Keep your web site current. No technical skills or special software necessary. Works with your new OR your existing website. Quick, easy, and free setup with our no obligation, no cost trial. Try it free for 30 days. No risk. No obligation. Click here for details. Keep it free forever, using the built-in sponsorship feature. Click here for details. ClubWizardTM is the complete website management solution for your club. Perfect for use by all types of organizations, it was originally built specifically for service clubs, such as Rotary Clubs®. In fact, ClubWizard has been serving Rotary Clubs® since 2001 and is the largest provider of Rotary Club® websites and integrated online club management. We currently serve Rotary Clubs ® across the entire United States and in countries on three continents. ClubWizard is the perfect solution for your Rotary Club website or Rotary District website. ClubWizard enables you to quickly and easily manage both your website and your club. Clubs around the world have found ClubWizard to be a valuable tool. By empowering any authorized member of your club to update your website, you can distribute the club management workload among several officers or members. 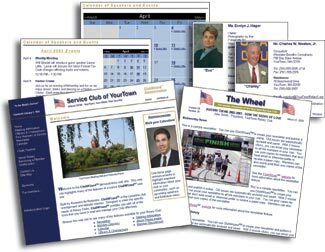 For example, the Newsletter Editor can create Newsletters, the Programs Chair can update the Calendar, and the Membership Chair can add new members. ClubWizard requires no special technical skills or special software. Any authorized club member with a computer and an Internet connection can contribute to your site. View our demonstration website to see all the Club Wizard features in action at a sample club. Explore this website to find out more about ClubWizard and how it can help your club easily get a comprehensive, quality website and club management tool at a reasonable price. Or, feel free to contact us for more information. ClubWizard complete website and club management. Powerfully simple to use.